The Boone Central boys basketball team had its mid-season winning streak stopped at seven and settled for fourth place in the annual Mid-State Conference Tournament Feb. 2-7. After scoring a dramatic last-second victory over West Point Central Catholic in the opening round of the conference tourney Tuesday, the Cardinals were stymied by Class C1 #2 Pierce in Thursday’s semi-final. Boone Central, shorthanded due to illness, then dropped a rematch with Battle Creek in the consolation contest one week after defeating the Braves on their home court. Boone Central stormed out of the gate, stumbled in the second half, then used a finishing kick -sparked by the late scoring heroics of senior Ryan Shotkoski – to defeat West Point Central Catholic 52-49 in the first round of the Mid-State Tournament Tuesday at Norfolk Catholic High School. “We got off to a very good start. We played pretty well for the first 14 minutes,” commented Card Coach Dan Zoucha. “Starting with the last two minutes of the second quarter, then through the third, we struggled at both ends of the floor. 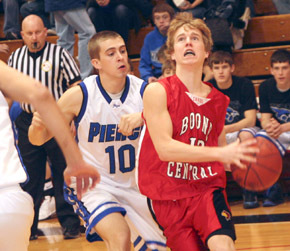 All you needed to know to guess the outcome of Boone Central’s semi-final game vs. Pierce Friday was the fact the Cardinals had more turnovers (23) than shot attempts (22). You won’t win many games that way. Pierce smothered the Cardinals throughout, holding Boone Central to single digits in the first three quarters of a 49-26 decision. “We knew going in that we needed to take care of the ball, but struggled to do so” said Zoucha. “We were never able to get into any sort of continuity on offense. Boone Central had a ‘Barry’ tough time in its rematch with Battle Creek Saturday, as Brave senior Robert Barry poured in 26 points to lead a 53-43 victory in the consolation final of the Mid-State Tournament. One week earlier at Battle Creek, a sagging Cardinal zone had stymied Barry, holding the 6-foot-8 center to 11 points, just three over the final three periods. Saturday, Barry abused Boone Central – minus three players battling illness, including stout 6-foot-4 junior center Nathan Olson – with a variety of turnaround jumpers, spinning hook shots and point-blank baskets. The Cardinals hung tough and pulled even in the third period behind a two-minute nine-point blitz by senior guard Dusty Dozler, but in the end, had no answer to stop Barry.